Tuesday was one of the more compelling days I've had since being named MLB's Ambassador of Inclusion. It included the opportunity to get back in uniform for the first time in ages at the behest of one of the most respected general managers in the game, and it also afforded me the first chance to respond to an active player speaking openly and honestly about me and my role in baseball. 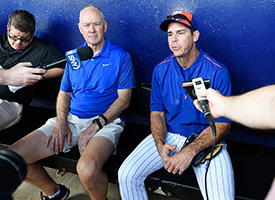 Some background: After making a presentation at the GM Meetings in November, Mets GM Sandy Alderson approached me about the possibility of coming to visit his club during Spring Training. And then, at the Winter Meetings a month later, he doubled down on that offer and asked me if I would consider suiting up and "playing" with the Mets for a few Spring Training games. I was stunned. Since my return, I have been adamant about not making the inclusion message about me. I'm simply the messenger, and with that in mind, I declined Sandy's invitation to play -- not because I didn't think I could do it, but I didn't want to take any attention away from his players. We spoke a couple more times over the offseason, and I began to understand his desire to show how the Mets feel about inclusion instead of simply talking about it. So we compromised a bit. I agreed to suit up, but only to help their players by throwing batting practice and assisting with spring drills. On Tuesday morning at Tradition Field in Port St. Lucie, Fla., I presented an edited portion of my story that MLB Network aired a couple weeks ago to the players, coaches and staff. I then spoke for a few moments to the entire group. And as the players began to return to the clubhouse, I went to my locker and put on a Mets uniform, just as Sandy and I had discussed a couple of months before. It was a rush to run out onto the field, even for a morning practice session. I can't deny the inner joy I felt to be wearing a big league uniform again. My career ended so abruptly, and even after all of these years, it still hurts that I didn't reach out for some help when I was closeted. I played catch with the outfielders, helped Mets first-base coach Tom Goodwin (a former teammate of mine) with cutoffs and relays, and then threw batting practice to the last group of hitters. It was like no time had passed. All the same things I did thousands of times many years ago felt so familiar. Everyone in Mets camp made me feel comfortable -- or even better, just like one of the guys. Players and coaches openly talked with me about baseball, the Florida humidity, and how fired up they are to have a good year in 2015. After practice, I met Sandy, and I watched an intrasquad game with him and Mets executives John Ricco and Paul DePodesta. Legendary baseball writer Peter Gammons was sitting in front of us, and it was great to listen to his stories as well. For a man like me who loves baseball, it was nearly a perfect day. When I returned to my hotel, I saw that I had many e-mails sent to me asking how I felt about the comments made by the Mets starting second baseman, Daniel Murphy, who told a reporter from NJ.com that because of his devout Christian beliefs, he "disagrees" with my lifestyle. "I do disagree with the fact that Billy is a homosexual. That doesn't mean I can't still invest in him and get to know him," Murphy told the website. "Maybe, as a Christian, we haven't been as articulate enough in describing what our actual stance is on homosexuality. We love the people. We disagree [with] the lifestyle. That's the way I would describe it for me. It's the same way that there are aspects of my life that I'm trying to surrender to Christ in my own life. There's a great deal of many things, like my pride. "I just think that as a believer trying to articulate it in a way that says just because I disagree with the lifestyle doesn't mean I'm just never going to speak to Billy Bean every time he walks through the door. That's not love. That's not love at all." I have tremendous admiration and respect for Daniel Murphy as a family man. Just last year, he made the decision to miss Opening Day for the birth of his son, and was criticized by some members of the New York media for this choice. Murphy deserved to be commended for putting his family first and that decision -- which led to an invitation to speak at the White House -- showed he's not afraid to stand up for what he believes in. When I took this job at MLB, I knew it was going to take time for many to embrace my message of inclusion. Expecting everyone to be supportive right away is simply not realistic. If you asked anyone who has competed in high-level men's professional sports, I believe they would agree with me. This doesn't change the way I go about my business, or my belief in what I am doing, but it's reality. After reading his comments, I appreciate that Daniel spoke his truth. I really do. I was visiting his team, and a reporter asked his opinion about me. He was brave to share his feelings, and it made me want to work harder and be a better example that someday might allow him to view things from my perspective, if only for just a moment. I respect him, and I want everyone to know that he was respectful of me. We have baseball in common, and for now, that might be the only thing. But it's a start. The silver lining in his comments are that he would be open to investing in a relationship with a teammate, even if he "disagrees" with the lifestyle. It may not be perfect, but I do see him making an effort to reconcile his religious beliefs with his interpretation of the word lifestyle. It took me 32 years to fully accept my sexual orientation, so it would be hypocritical of me to not be patient with others. Inclusion means everyone, plain and simple. Daniel is part of that group. A Major League clubhouse is now one of the most diverse places in sports. It wasn't always that way, but we can thank No. 42 for that. So in his honor, with a little patience, compassion and hard work, we'll get there. Billy Bean is Major League Baseball's Ambassador for Inclusion.